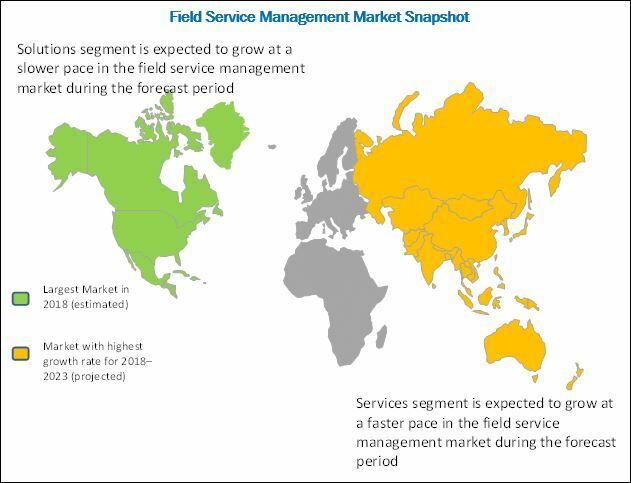 [157 Pages Report] The field service management market was valued at USD 2.12 Billion in 2016 and is expected to reach USD 5.08 Billion by 2023. The global market is expected to grow at a Compound Annual Growth Rate (CAGR) of 14.7% during the forecast period. The forecast period has been considered from 2018 to 2023, whereas 2016 is considered as the base year for estimating the market study. The main objective of this report is to define, describe, and forecast the field service management market on the basis of components (solutions and services), deployment types, organization size, industry verticals, and regions. The report provides detailed information about the major factors (drivers, restraints, opportunities, and industry-specific challenges), influencing the growth of the market. The report forecasts the market size with respect to 5 main regions, namely, North America, Europe, Asia Pacific (APAC), Middle East and Africa (MEA), and Latin America. The report profiles the key market players and comprehensively analyzes their core competencies. 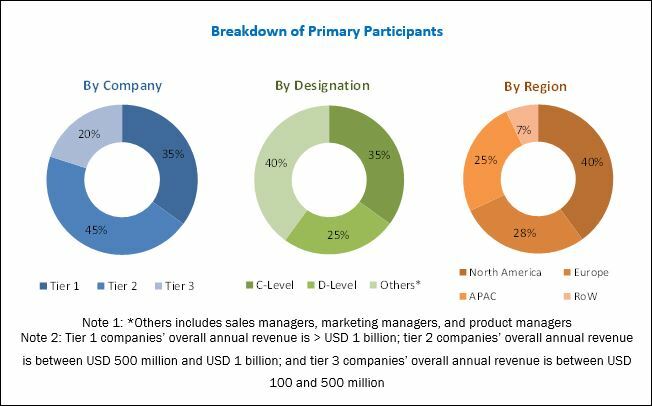 This report also tracks and analyzes the competitive developments, such as mergers and acquisitions, new product developments, and Research and Development (R&D) activities, in the global market. The research methodology used to estimate and forecast the field service management market began with the collection and analysis of data on the key vendors’ product offerings and business strategies from secondary sources, such as OneSource Business Browser, D&B Hoovers, 10K Wizard, Bloomberg, Thomson StreetEvents, Factiva, IT service providers, technology providers, press releases, and investor presentations of companies, white papers, technology journals, certified publications, and articles by recognized authors, directories, and databases. Vendor offerings were also taken into consideration to determine the market segmentation. The bottom-up procedure was employed to arrive at the total market size of the market from the revenues of the key market software tool and service providers. After arriving at the overall market size, the total market was split into several segments and subsegments, which were then verified through primary research by conducting extensive interviews with key people, such as Chief Executive Officers (CEOs), Vice Presidents (VPs), directors, and executives. The field service management ecosystem comprises several vendors, including Accruent (US), Acumatica (US), Astea (US), ClickSoftware (US), Comarch (Poland), Connect My World (India),Coresystems (Switzerland), FieldAware (US), GEOCONCEPT (France), IBM (US), IFS (Sweden), Infor (US), Jobber (Canada), Kickserv (US), Microsoft (US), Oracle (US), OverIT (Italy), Praxedo (France), Salesforce (US), SAP (Germany), ServiceMax (US), ServiceNow (US), ServicePower (UK), ServiceTitan (US), and ServiceTrade (US). The global field service management market is expected to grow from USD 2.56 Billion in 2018 to USD 5.08 Billion by 2023, at a Compound Annual Growth Rate (CAGR) of 14.7% during the forecast period. The increasing adoption of mobile applications and wearable devices among fieldworkers and the efficient planning of project and better work allocation for field workersare expected to drive the market across all regions. The field service market has been segmented by component (solution and service), deployment type, organization size, industry vertical, and region. The services segment is observing great opportunities and importance among end-users, due to an increase in support and training services. Among solutions, the mobile field service management segment is expected to grow at the highest CAGR during the forecast period, as it helps field service representatives increase their productivity through real-time collaboration among themselves and other office staff. The cloud deployment type is expected to grow at a higher CAGR during the forecast period. The cloud deployment type is also projected to witness the highest demand, as the cloud-based field service management solutions offer flexibility, scalability, low cost, and real-time access to data, regardless of the location of employees. Field service management solutions are deployed across various industry verticals, such as Banking, Financial Services, and Insurance (BFSI), telecom and IT, manufacturing, consumer goods and retail, construction and real estate, transportation and logistics, energy and utilities, healthcare and life sciences, and others (Government, and Media and Entertainment). The telecom and IT industry vertical is expected to witness the highest CAGR during the forecast period. Due to the rapid development of telecom capacity and network, field service management solutions provide telecom enterprises with enhanced scheduling across regions. Moreover, field service management solutions empower telecom service providers to manage their work orders, track their workforce, retrieve real-time information from field representatives, and validate compliance requirements. However, the manufacturing industry vertical is estimated to have the largest market size in 2018, as enterprises in this industry vertical are focusing on making their business operations efficient by leveraging the benefits of latest advancements in the IT technology. In addition to this, field service management solutions provide organizations in the manufacturing industry vertical with several advantages, such as shorter billing cycle, enhanced customer satisfaction, increased productivity of business processes, and optimal utilization of workforce. The global field service management market has been segmented on the basis of regions into North America, Europe, Asia Pacific (APAC), Middle East and Africa (MEA), and Latin America to provide a region-specific analysis in the report. The North American region is expected to be the largest revenue-generating region for field service management solution and service providers in 2018. This can be attributed to innovations obtained from Research and Development (R&D) and the adoption of technologies, especially in the developed economies of North America. The APAC region is expected to be the fastest-growing region in the market. The growth in this region is primarily driven by the increasing number of cloud service providers, investments in infrastructures, the growing number of smartphone users, and many emerging industry verticals in the region. The field service management market faces challenges, such as security concerns related to data confidentiality and slow growth in the developing and underdeveloped economies. These challenges are expected to hinder the growth of this market. The major vendors that offer field service management solutions and services across the globe include Accruent (US), Acumatica (US), Astea (US), ClickSoftware (US), Comarch (Poland), Connect My World (India), Coresystems (Switzerland), FieldAware (US), GEOCONCEPT (France), IBM (US), IFS (Sweden), Infor (US), Jobber (Canada), Kickserv (US), Microsoft (US), Oracle (US), OverIT (Italy), Praxedo (France), Salesforce (US), SAP (Germany), ServiceMax (US), ServiceNow (US), ServicePower (UK), ServiceTitan (US), ssand ServiceTrade (US). These vendors have adopted different types of organic and inorganic growth strategies, such as new product launches, partnerships and collaborations, and mergers and acquisitions, to expand their offerings in the market. *Details on Business Overview, Products/Services Offered, Recent Developments, MnM View Might Not Be Captured in Case of Unlisted Companies.